Have you ever tried washing dishes without soap? It doesn’t work well, especially if there’s a lot of grease, fat, or oil on the dish! The oils and fats are slippery and repel water, which makes them a great choice for lubration of bearing and wheels, but lousy for cleaning up after dinner. So what’s inside soap that makes it clean off the dish? The soap molecule looks a lot like a snake, with a head and a tail. The long tail loves oil (hydrophobic) and the head loves water (hydrophilic). 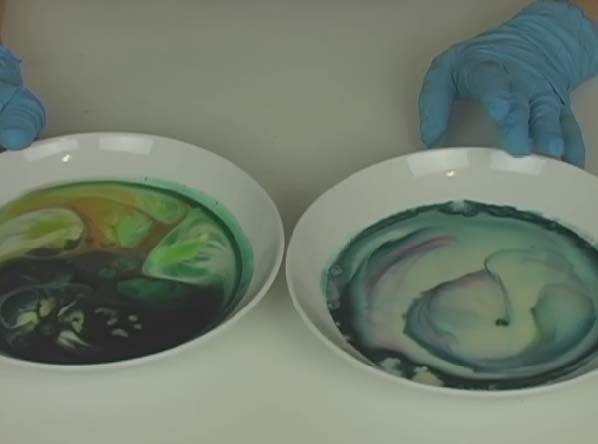 The hydrophilic end dissolves in water and the hydrophobic end wraps itself around fat and oil in the dirty water, cleaning it off your dishes. Sure! Try it with cooking oil and water instead of milk. Absolutely! Whole milk works best. This is so cool,and can you use milk with fat in it? Let me know if it works… it should! is it okay if we diluted the milk already? #this type of art is better then me! im a pretty good artist im not nearly good as one of my friend’s art neither as good as this type of art! ill have to do this on saturday LOL! What if you do it with Almond Milk. Try and see what happens?! So if I use a lot more whole milk then the show will be longer? Make sure you’re logged in first! Wow. We must have spent 20 minutes staring into that bowl. You can continue to add new drops of soap after the last calms down. It’s like watching nebulae form. The boys loved it. It look like artwork. Cool!